This time last year I was busily revising my stories that I would submit with my application to Clarion West. It was my third time to apply to the workshop. This doesn’t mean I’m a worse writer than those who got in on their first try, or that I’m a better writer than those who weren’t accepted for the workshop. It just means that last year I was at the right place in my writing life for me to benefit the most from attending Clarion West. I’m thankful to the judges who didn’t accept me the first and second times that I applied, because I was not ready. It’s easy for me to say that now, after I’ve been to Clarion West. But I still remember how it felt to apply and not be accepted. I was terribly crushed each time I received the rejection email. I felt ready. But looking back on the stories I submitted, I realize now that I wasn’t. The first year I applied I submitted an excerpt of a novella, with a synopsis of the ending. It was a story that my graduate classmates had really liked, it was fantasy, but it had no structure and no emotional core. I applied to Clarion West at the last minute, using a version of the story I hadn’t looked at in weeks. I felt like I had it in the bag. I wasn’t accepted. The second year, I submitted a literary short story (by literary, I just mean that it didn’t contain any speculative element). This was an earlier version of a short story I eventually sold. It was a fine draft of the story. It had an arc, real characters, things happened. But it didn’t have specific details, and there were parts that needed to be cut to get to the real heart of the story. I applied once again feeling like I had to be accepted, and once again I received a rejection email. This time, however, my rejection email had an additional line added, prompting me to apply again next year as my story had ranked highly with the judges. The third year, the year I was accepted to Clarion West, I spent the entire month of February working on my submission stories. I revised, edited, and revised again two stories. One was a story that had an experimental structure. The other was a short piece that was lyrical and intensely emotional. Both had elements of fantasy. In essence, I worked on two stories that displayed my strengths and interests as a writer. I showed my style in these stories. And although they did not have the best structure and I have revised them post-workshop, they were a clear impression of my writing abilities. I submitted. I decided not to get excited. Then Neile called to tell me I was in. Clarion West is open for submissions for their annual writers workshop. This year the instructors are Mary Rosenblum, Hiromi Goto, George R. R. Martin, Connie Willis, Kelly Link & Gavin Grant, and Chuck Palahniuk. The deadline for applying is March 1st. You can find more information on applying here. If you’re thinking of applying, then go for it. Even if you think you can’t afford it, or that you won’t get in. If you’d like to go, please take the time to apply. Clarion West is an amazing experience, and people will help you get there if you’re accepted. And if I may suggest, write the type of story that you love. Use the writing devices that make you smile and keep your fingers on the keyboard late into the night. Because if you love writing it, there’s a good chance that the judges will love reading it, too. And as much as you can bear, spend less time looking for Clarion West blogs, and more time revising and editing your stories. You’ll have all of March to spend daydreaming about what it will be like at Clarion West. And if you don’t get in, try again next year. And the next. Writing isn’t a race against other people, it’s a personal journey. The only person you’re competing with is your past selves, to be a better writer each new day. Good luck to you! I hope you find yourself at Clarion West this summer. 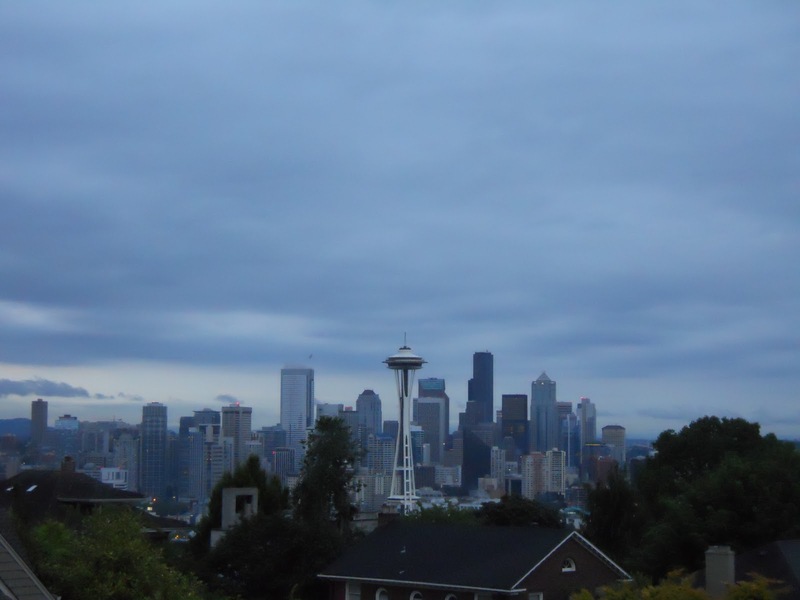 The view of Seattle from one of the Friday evening parties at Clarion West 2011. Reminds me that rejection is a chance of revision. Which also reminds me I should go back to my script. But as for writing being a race? Oh, I like to think it is =) But is it a marathon or a sprint? I guess that depends on how long one lives. But then again, I used to run track so running metaphors sit fine with me.